Yarn substitution is always a gamble. There is a reason that the yarn was paired to the pattern by the designer and the pattern reflects the characteristics of that yarn. Choosing an different yarn is entering at your own risk – if it doesn’t work out you’re sort of sunk. Nothing’s worse than a mismatched project and yarn. But if you can find the right alternative yarn, you’ll have a fabulous FO that you’ll love and cherish. Ultra Alpaca is maybe the ideal yarn for me. It knits up at a practically perfect gauge, plus it has a little drape from the Alpaca and a little bounce from the wool. It comes in an amazing palette of shades and I’m consistently impressed by this workhorse yarn, but it isn’t for all seasons/climates. So what do you knit with if this beauty of a yarn just isn’t your style? Berroco Maya is an excellent alternative. The combination of 85% Pima Cotton with 15% Alpaca makes a soft draping yarn with just a hint of halo from the Alpaca and the chainette construction gives just that little bit resiliency that I love about Ultra Alpaca. 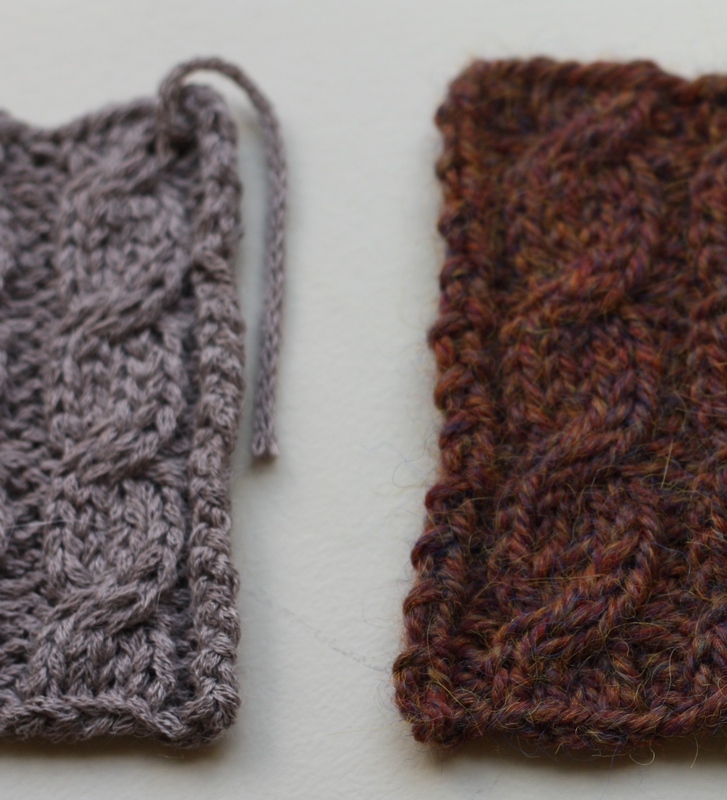 To compare the two yarns, I swatched the a simple 2-over-2 cable and rib. Both swatches were knit on a size US 7/4.5mm needle and both were steamed. 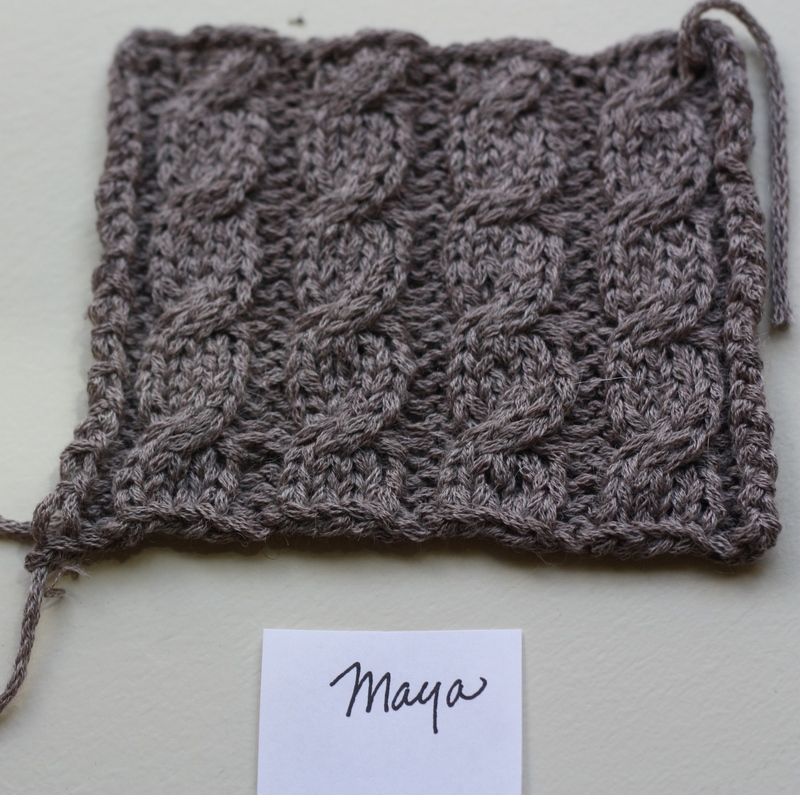 The row gauge for the Maya does end up a few rows short of the Ultra Alpaca. This means if you’re making a fitted garment you have to pay close attention to things like depth of the armhole, but this is easily managed- you can try another needle size which will effect row gauge more than it does the stitch gauge. If you’re like me and you like the fabric as it is on this needle, you can always add or subtract a few rows when you get to sleeve caps. This is something you can adjust as needed while you knit. 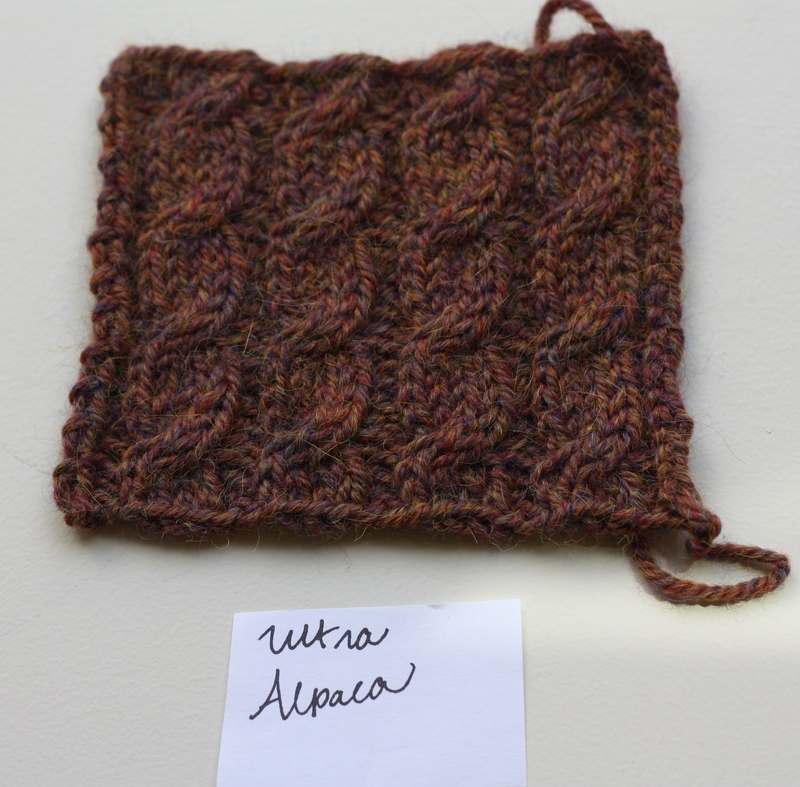 Otherwise I would consider these a successful match – nearly any pattern written for Ultra Alpaca could be fairly easily substituted with Maya or vice versa. Have you had any success swapping one Berroco yarn for another?